Heat oven to 450°F. In 15x10-inch pan, melt butter in oven; spread evenly in pan. Sprinkle 3 tablespoons of the wheat germ evenly over butter. In medium bowl, beat orange juice, honey and egg whites with wire whisk until foamy. Dip bread into egg mixture; arrange in single layer on hot pan. Drizzle any remaining egg mixture over bread; sprinkle with remaining wheat germ. Bake 10 minutes or until bottoms are golden brown. Turn; bake 6 to 8 minutes longer or until golden brown. Meanwhile, in blender, place all Blueberry Sauce ingredients. Cover; blend on medium speed about 45 seconds or until smooth. Into bowl, strain sauce through strainer to remove pulp; serve with French toast. 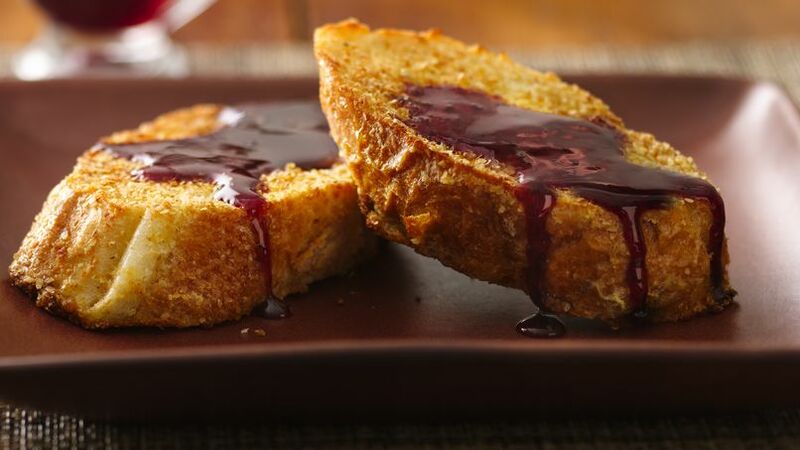 Enjoy this citrusy French toast that’s served with blueberry sauce.